Remember this from 2008? Greg L's latest contribution is an oldie but definitely worth a mention. For the record, the error was spotted by someone involved with printing. Interestingly enough, there's no reference to the Council's reaction in the BBC article. Here's what the Birmingham Post had to say. Despite the gaffe, council officials have insisted the pamphlet - a second print run of the Recycle: Your Questions Answered - will not be recalled, pulped or reprinted. 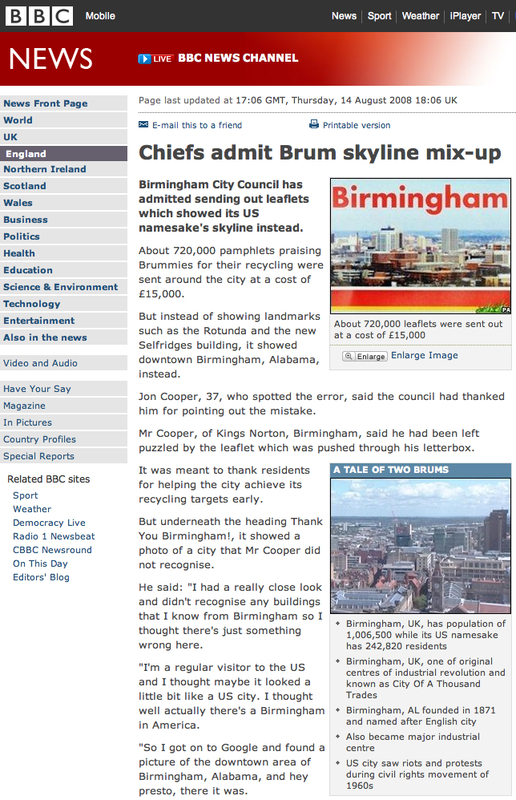 The mistake was spotted by Jon Cooper when the leaflet was delivered to his Kings Norton home. The 37-year-old, who works for a Midland packaging firm, said: “I emailed the council last week, after the leaflet came through my door, to draw attention to their mistake. “I work in the packaging industry and we have to check all our printed materials thoroughly, because if we don’t spot a mistake you can be sure Sainsbury’s or Tesco will, which is why I can’t believe nobody at the council noticed this before the leaflets were sent out. Mr Cooper added: “I would have thought the city council would be a bit more bothered about the image that they put out of this Birmingham, especially if it’s going into hundreds of thousands of homes. A city council spokesman claimed there was "no point tinkering with it” and described the offending photo as “a generic skyline picture”. He added: “The picture on the leaflet is meant to symbolically represent an urban area. Since its first publication last year, the leaflet has been well-received by residents, and is the most requested document to be produced by the Fleet and Waste Management Department. “Feedback from households has been very positive - the leaflet has achieved its aim of informing citizens about the recycling options, both doorstep and other, that are available to them. I wonder if the council spokesman studied at the David Brent Management School. 'A generic skyline picture...meant to symbolically represent an urban area'. Yeah, right. So why not use a photo of Glasgow or Leeds? Or even, dare I suggest, Birmingham? Birmingham, England, that is. I like the statement that the leaflet 'is the most requested document to be produced by the Fleet and Waste Management Department'. So exactly how many documents does the Department produce? I'm inclined to think that this may well be one of a small number. A very small number indeed. A very small number such as one, for example. Apparently, Marketing Birmingham, the agency charged with promoting the city nationally and overseas, declined to comment on the council's case of mistaken identity.